Glens Falls, NY has become one of America's greatest small cities! Officially established in 1908, Glens Falls offers friendly neighborhoods and a strong presence in the areas of business, tourism, technology and the arts. Like many cities, towns and villages in the area, Glens Falls has been at the forefront of important moments in American history. Named Chepontuc by the Iroquois (or Haudenosaunee), European-American Quakers referred to this area as "The Corners" upon their settlement here. Its location between Fort Edward and Fort William Henry made this ever-growing village the site of major battles during the French and Indian and Revolutionary wars. The city's name was changed again in 1766, this time to "Wing's Falls" for its Quaker founder, Abraham Wing. Local legend says Wing lost the naming rights in a game of cards with Colonel Johannes Glen in 1788, giving the then-hamlet its final name change: Glens Falls. Glens Falls is home to many successful corporations including Boston Scientific, Angiodynamics, and Finch Paper, LLC (formerly Finch, Pruyn & Company). The area also has a plethora of smaller companies and unique local businesses. Glens Falls Hospital, a leader in Warren County and beyond for medical care, employs hundreds throughout the region. 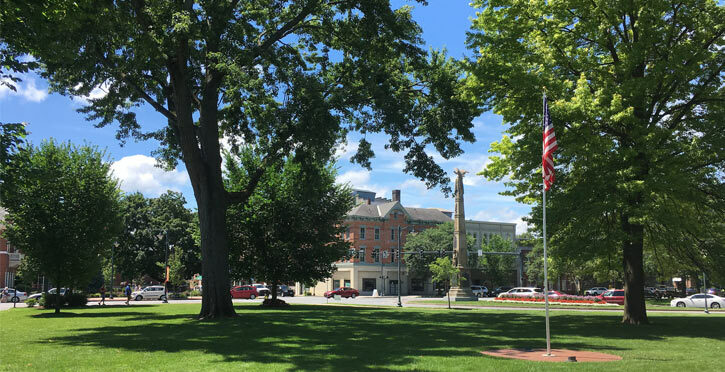 Stay busy in Glens Falls: there's plenty to do! Visit the many restaurants, shops and museums. Enjoy a show or musical at the renowned Charles R. Wood Theater, or a relaxing afternoon at the modernized Crandall Library. Popular events like the Adirondack Balloon Festival, LARAC Arts Festival and Cool Insuring Arena concerts, games and shows draw many to Glens Falls all year long. The City of Glens Falls is also a haven for recreation. The abundance of parks, playgrounds and sports fields will keep you active. Anyone can use the trails in Crandall Park and Cole's Woods for running, skiing or walking. Bike along the Warren County Bike Path from Glens Falls to Lake George for an alternate method of transportation. Nearby, Queensbury and Lake George offer many lakes, streams and beaches with easy access to water for swimming. You'll fall in love with Hometown USA! Glens Falls is the ideal home for young families, offering all the opportunities and amenities of a big city with a small community feel.